One picture is worth 1000 words, but that’s just an average value. Some are worth much less and others are worth much more. The cartoon at left is one of those extra-valuable pictures. Iowa allergy mother Elizabeth Marz-Bostic illuminates the daily ritual of getting her children off to school from the inside out in ways that words couldn’t. 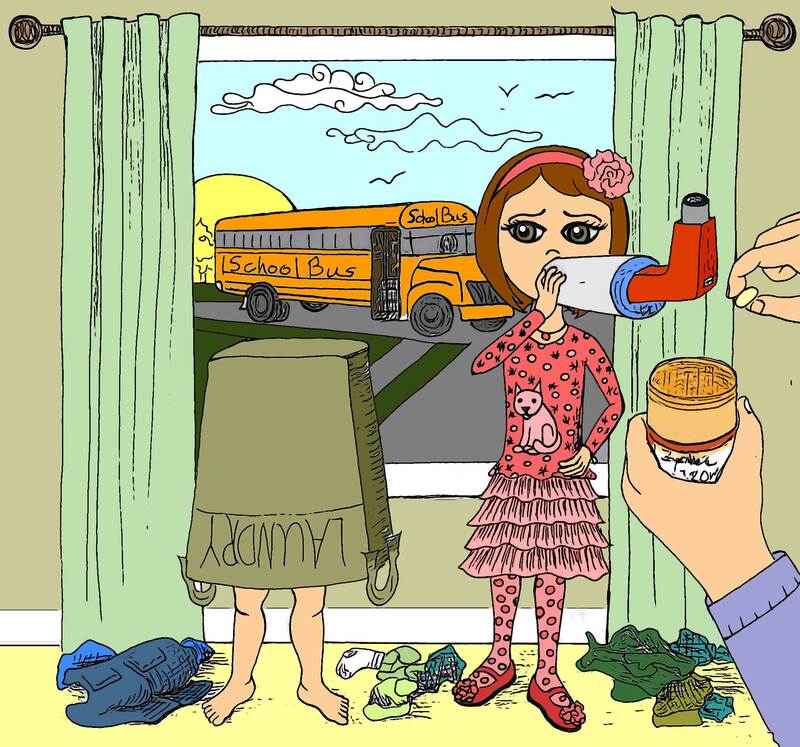 We often write about the problems of complying with a medication schedule for managing allergies and asthma, and by extension any chronic disease. I have my own version of this—my daily statin, Vitamin D, and low-dose aspirin are annoying enough. I’m glad that I’m not responsible for anyone else at the moment. Medicating two kids, negotiating their diets, and getting them onto a school bus every morning are major challenges, particularly when a child has a mind of his own, as Elizabeth’s son clearly does. What’s a parent to do? Fortunately for Elizabeth she has the wit to find humor in her family’s plight and the talent to express it. Thank you for sharing. Elizabeth Marz-Bostic is an art teacher and artist living in rural Iowa. She is a mother of two fantastic kids who happen to have allergies and asthma. She draws inspiration from her everyday experiences, and learning to help her children thrive with allergies and asthma. You can find more of her illustrations at thrivingwithallergies.blogspot.com. Love it ….. Perfect! Good work Elizabeth and Henry.